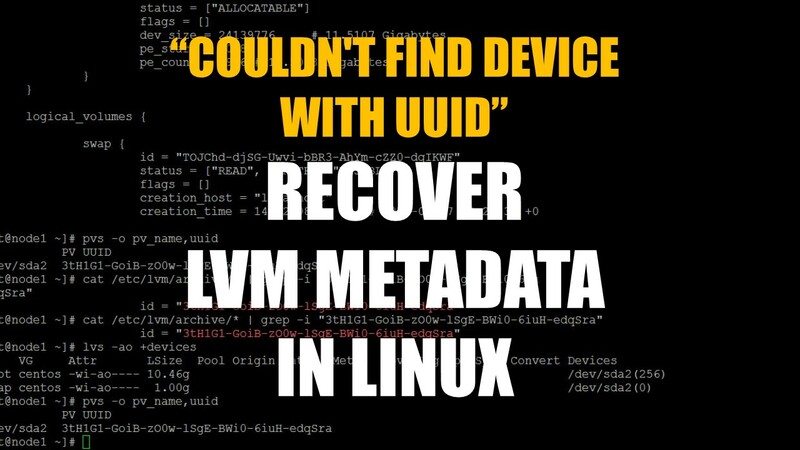 This post shows you how to recover LVM physical volume metadata in linux when you get an error something like "Couldn't find device with uuid". This is mostly because of a physical volume is accidentally removed, overwritten or destroyed. So LVM wont be able to find a original physical volume associated with a Volume Group with particular UUID, hence you get an below error when you use any lvm commands. Couldn't find all physical volumes for volume group vgroot. By writing a new metadata on the new physical volume by using the existing UUID, we can recover the LVM Metadata. From the above error, we have got the UUID "FmGRh3-zhok-iVI8-7qTD-S5BI-MAEN-NYM5Sk". By default, the LVM label is placed in the second 512-byte sector. The LVM label identifies the device as an LVM physical volume which contains the UUID for the physical name. It also stores the size of block devices in bytes, and LVM metadata stored on the disk. An identical copy of the metadata is maintained in every metadata area in every physical volume within the volume group. Confirm the UUID of the physical volume from the corresponding VG (vgroot) file (VolumeGroupName_xxxx.vg) under the directory /etc/lvm/archive. [root@learnitguide1 ~]# cat /etc/lvm/archive/* | grep -i "FmGRh3-zhok-iVI8-7qTD-S5BI-MAEN-NYM5Sk"
Use the --uuid and --restorefile arguments of the pvcreate command to restore the physical volume. Couldn't find device with uuid FmGRh3-zhok-iVI8-7qTD-S5BI-MAEN-NYM5Sk. Use vgcfgrestore command to restore the volume group's metadata. Now your physical volume metadata is recovered. Use pvs command to ensure the UUID is replaced or not. If the volume is not active, then activate the volume. Else this step is not required. Hope you have got an idea how to restore or recover the LVM metadata using UUID. 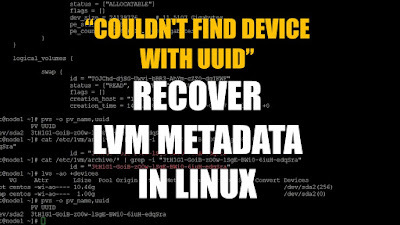 Couldn't find device with uuid, Recover LVM Metadata, recover linux lvm metadata, restore uuid, how to restore uuid, how to recover corrupt lvm in linux, recover lvm physical volume, vgcfgrestore linux.